If you pre ordered and have your CC info up to date you probably already received your game. Online sales in early January. The game will handle the three operations centered on the mainland of Italy, Avalanche, the main invasion a few miles south of Naples, Slapstick, the capture of the large port and Italian naval base, and Baytown, the effort on the "toe" the boot by the British and Canadian divisions of 8th Army. Battalion scale and it uses an updated fog of war system called the Variable Combat Series. This allows for a lack of complete knowledge on the exact dispositions, strength and makeup of the enemy and even the units under your own command. Each game will be unlike the last due to a random strength chit held by the main parent units of the force. Split scale and transit tracks keep large distances under control on two 22 X 24 inch map sheets and bring together the three operations to present a classic offensive as well as a difficult defense and counterattack. This is done on a unique 6 level terrain map to show the monumental effect that the Italian mountains had on operations. 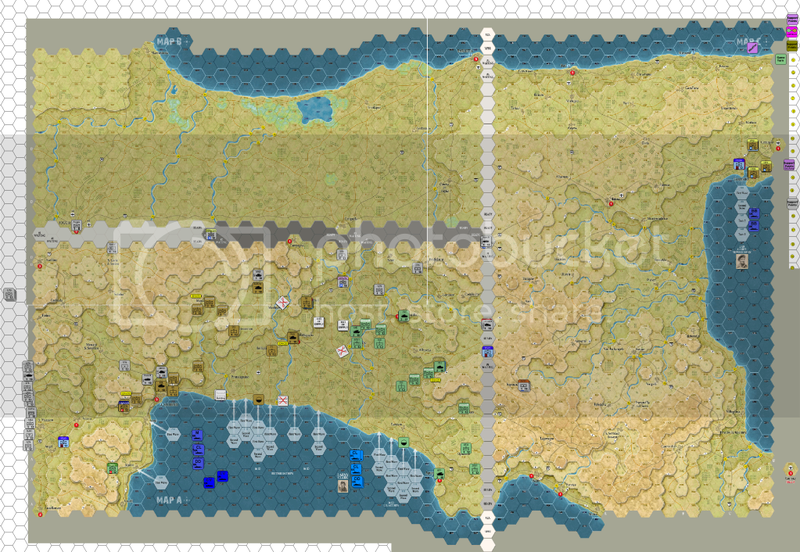 Three alternate history scenarios, one 4 turn invasion scenario and an 18 turn historical campaign game explore how it was done and what could have been done at the start of the road back to Berlin on the European continent. There is already a Vassal module created by Greg Blanchett and it works very well with some added fog of war features to help game play feel more like tabletop. It will become available when the official launch is announced. I'm following MMP's page on the CSW forums to assess just when they will get artwork and some advertising to promote Salerno to the Pre-order page. A comment about their push to save Angola from the scrap heap if more pre orders dont come in made me wish for a truely objective developer that will be able to iron the wrinkles still in Salerno out to make it the definitive study of the varied operations that I intended it to be. Niko, their famous map artist will get the assignment. I am like an expectant father watching the creation of something very wonderful take place but not knowing the hair color and unique look that it will take on after the MMP treatment is applied. I hope after much study and wrestling that this will come through the process as well as some of their other award winning efforts have. The box artwork has been released, and it looks good. I'm looking forward to seeing this game when it is finally ready. BTW, this is a rough low resolution shot I pasted into Cyberboard for this demonstration. The map I played on at WBC, even though not the final proof, was very nice. Click on the map below and several more are in the gallery. Only niggle I have with that is... wouldn't players sit on west and east sides of the map? So the charts should face the players (i.e., facing north toward the center of the map). I'd hate to see someone cut a chunk out of the map! Not sure if there will be a loose chart in addition to this. I begged Niko to include as many as he could fit on there to keep out of the rules and clutter. No Idea what is left in the budget, so if we are going to get set up sheets, this is one way to lean in that direction. As far as I know, there will be two maps that join together to make this possible. I will update the rules before thanksgiving BTW Greg. Just updated the header and added an example of play. As I type this, a vassal version is in the works. This is headed up by the MMP developer, Nick Richardson, for playtesting and troubleshooting to make sure the final version gets a workout. Already, some people are volunteering to play the vassal version and put it through the process to complete the balancing. My solo playtest had a storm rolled for weather and a German variable division made available, both rare occurrences due to the necessary die rolling. The adjustments at end game were made by me and taught some of the most important lessons for the German strategy that were not obvious in most of the earlier games. The best is yet to come with completely blind testing to get an objective assessment of Salerno as a game first, and a simulation second, with both goals in mind. Ok Yesterday I received a set of Standard and a set of Exclusive rules for Salerno in typeset, PDF form with colored cover and sample units and I think fairly close to what will be in the box set. I also received a Vassal module to enhance testing and, lets face it, a ton of utility at the touch of a couple of buttons. Nick Richardson has come through and added some extras that I was sending him as of a few days back. This means his whole holiday was spent in shining and polishing the game to take the next steps. I am getting excited as to what the next news will be. I had a great 5 days at CSWE11 in Tempe Arizona, showing VCS Salerno to the group of 250 or so gamers, designers and industry supporters. I showed up with a newly updated color, laminated map and prepub counters, sign and freshly minted Standard and Exclusive rulesets. Added to this was the updated charts, combined on a cardstock for handy reference, updated support point/victory point summary sheet on the back of the updated Variable Reinforcement chart. A day with Andy Loakes kicked us off and then three days introducing the system to Cory Wells, my friend for the last 25 years and singer for the band Three Dog Night, forged ahead to play a complete game inbetween the event fun, eating and extras. The game was a big hit, especially the look of the map. I got verbal promises of preorders and look for more to finish the 550 requirement we need to get this game finished. I just finished attending and playing for 5 days in Tempe Az at the CSWE11 Monstercon convention. I had a couple of good players in two games and a demo to Shannon Cooke and Dirk Heinz. Explaining several times to some of the great guys who already ordered and are looking forward to the subject at this scale that will tell a different point of view on what probably most of us have little knowledge of, especially in game simulation. Around a dozen people told me they would preorder after looking at the full game in progress. I don't know that this percentage of 225 attendees amounts to much, but at least its movement. It cost quite a bundle to attend shows and promote a game. Since we love what we do so much, it hardly matters, but the response could perhaps be greater in the preorder department. I am expecting a groundswell in orders after Consimworld Expo, but am only seeing a hairline crack in the dam of orders I need to get to the 550 target. John Kranz emailed and will do some promotion for me simply on the beauty of the map Niko did. Several people who had never seen the full size display were raving about it. I seriously think there has to be a better way to show a product and help people off of that fence. All in all, I had a great time. Frank Chadwick was there and looked the game over, but was primarily looking at his old GDW Avalanche that was being played, making notes and commenting on the players concerns. 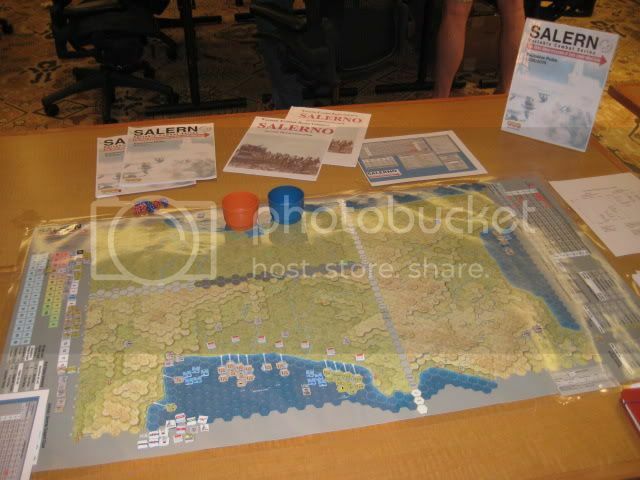 It was great to see all of this going on and it helped everyone to pay attention to the WWII Med with OCS Sicily there all week and a DDH Sicily playtest map setup.